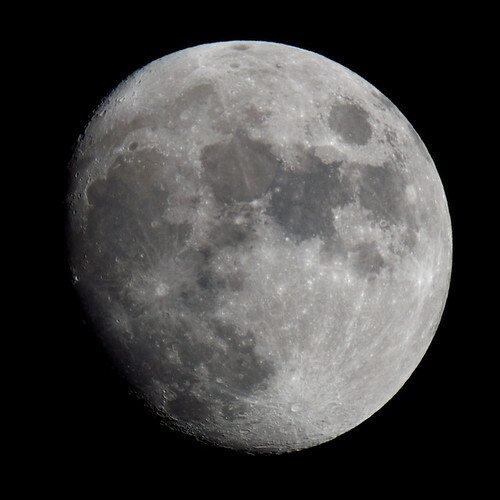 The advantage of photographing the Moon with a 2× Powermate is that it doubles the focal length — in this case from 500 mm to 1,000 mm — making your target object much larger to the camera and covering more pixels on its sensor. But it’s not without its challenges. Because it doubles the telescope’s focal ratio — in this case from f/6.25 to f/12.5 — it requires longer exposures. At nearly a full moon, this image was taken at 1/250 s, the same shutter speed as this crescent Moon shot without the Powermate (a crescent Moon is much less bright than a full Moon); this shot of a full Moon, similar to the one above, was at 1/2000 s.
The combination of these two factors — larger image, slower shutter speed — is going to require me to get a better, sturdier mount than the camera tripod I’ve been using in an improvised manner. The tripod was jittery to start with, but that wasn’t really a problem because (a) I was using ridiculously fast shutter speeds when shooting a bright moon at f/6.25 and (b) I was photographing a tiny Moon that could bounce all over the camera’s field of view without disappearing. Not only am I now trying to capture a larger image at slower speeds, but the Powermate adds more than half a kilogram to the back end of the telescope, making it harder to hold steady and to centre it on the image. I was actually supporting the camera in my hands as I took pictures. I’d never be able to take a shot like this with this setup — especially since the exposure would have to be much longer with the Powermate. So my next step is to graduate from using a rather flimsy camera tripod to a sturdier mount, perhaps a grab-and-go alt-azimuth mount for observing that would also double for lunar photography. But that’s a topic for another post. 1 A T-ring adapter is one of two items used to connect a camera to a telescope. The other part is the T-ring, which attaches to a camera’s lens mount and allows the camera to connect to a standard T-ring adapter, which then goes where the eyepiece or star diagonal goes.